In 1936, the Imperial Hotel was set for wrecking. 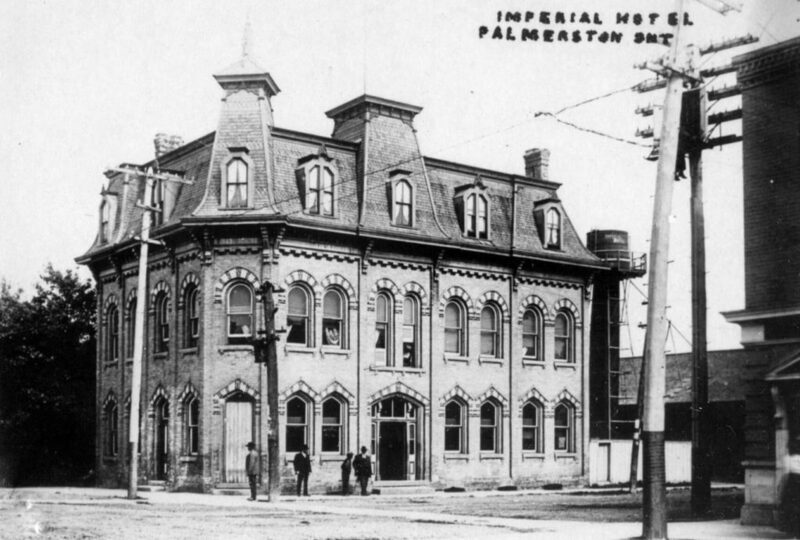 As the wrecking date drew near, the Palmerston Observer kept the town updated on the progress. Below are some articles taken from the Palmerston Observer, which illustrate a piece of the Imperial Hotel’s history. The old Imperial Hotel which has stood at the corner of Main and William streets for over half a century is in the primary stages of being wrecked. Some months ago McRae and Embury, who operate a garage and service station at the rear of the old landmark, purchased the building, and last week commenced dismantling the east end of the structure. The building, which was full of tenants, will likely be vacated by March 1st and work will then commence in completely wrecking the structure. McRae and Embury propose erecting a large service station on the site. The tenants have been vacating the building one by one. C.W. Brown, who had his residence at the rear of the building, moved his household effects to the residence of the late Richard Wilkin on Inkerman Street a few weeks ago. H.T.H. Pugh, chiropractor, vacated his office last week and moved to the rooms over T Randall’s store on Main street. Dr. N.L. Milne, dentist, is moving his office to his residence on Main street and Nye and Collins, grocers, who have not vacated their stands as yet, will move shortly across the street in the vacant store west of Palmerston Cafe. Just where C.W.Brown’s tailor shop and the Naturelle Beauty Salon who are still in the building will be located, had not yet been ascertained. Peace Chapter No. 52 O.E.S Lodge rooms are located on the third floor of the building and they too have to find a new location. 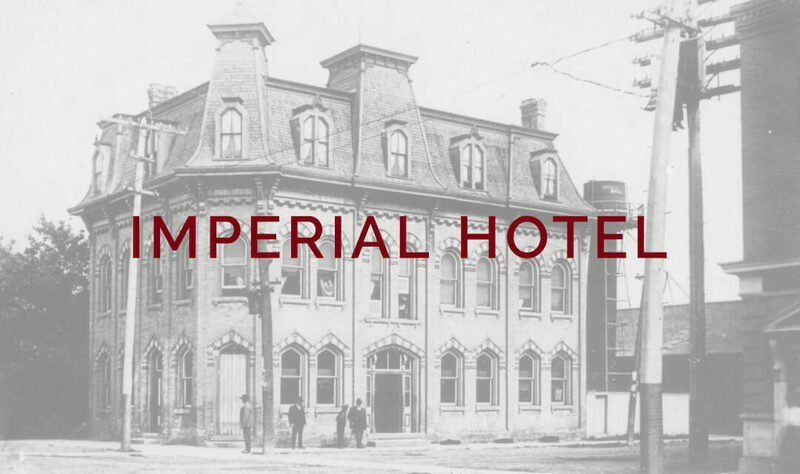 The old Imperial Hotel which stands at the corner of Main and William streets, and is at present in the stage of being wrecked in order to make way for a large service station, is a veritable landmark. It having been erected in the year 1873 by a Mr Thompson. At that time, however, the portion of the present building on the east side was all that was built, and was a frame structure. Shortly after its construction a man by the name of Bates purchased the building who in turn disposed of it to Mr. M.Barley. A Palmerston commenced to expand and families from all parts of the continent came to reside within the town’s boundaries, need for extra hotel accommodation was required and seven years after the frame structure was erected, Mr. John Watt of Mitchell, acquired the hotel and made quite extensive alterations. 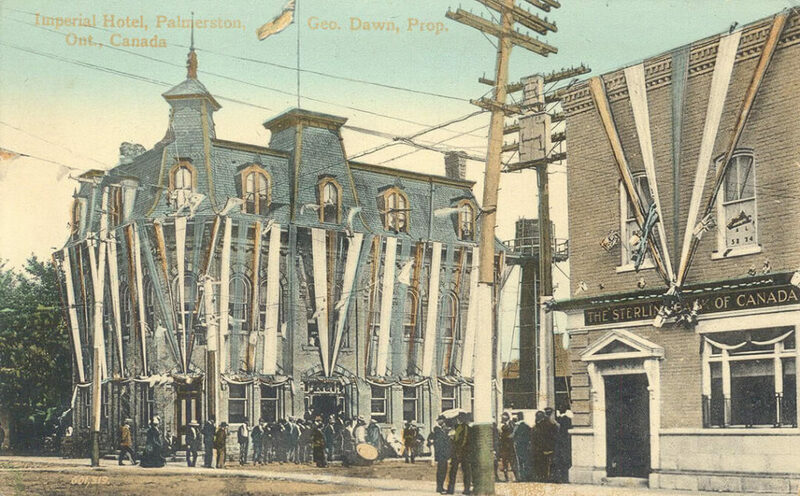 Mr. Watt, being of a progressive nature, laid plans for a larger building and in 1879 a three-story solid brick addition was erected adjoining and completely drawing the original hotel, and it became one of Palmerston’s finest buildings. During the building, the original frame hotel came in for attention, and it was bricked to harmonize with the larger addition. The building continued to operate as a hotel with such proprietors as John Watt, Matthew Upkin, Samuel Schneider, Fred Crouse, and George Daum, until 1917 when it was closed to the public as a tavern. Mr T. Bramhill, Fourth of Minto, purchased the structure and the main floor was operated as a store by the Farmers Co-operative Co., but in later years several tenants acquired space within its portals. Prior to the purchase of the building recently by McRae and Embury, several tenants occupied space there. As was stated in our last issue, McRae and Embury intend to erect a large service station on this site when the building is completely wrecked. Two more merchants vacated the Imperial Hotel building this week. Mr. C.W.Brown moved his tailor shop to the store formerly occupied by Ray’s Fruit Store on Main street, and Collins and Nye took up quarters in the vacant store west of the Palmerston Cafe on Main. The Central Hotel building which is being wrecked to make room for an up-to-date gasoline station, is in its final stages of demolition. The two top stories are down and soon the foundation will be laid bare. Huge piles of lath, plaster, bricks, and lumber have accumulated during the wrecking process, and these are being hauled away rapidly. A gang of men are engaged cleaning the brick salvaged from the building and working at dismantling the remaining parts of the structure, and it is expected that work on the old building will be completed this week. The corner of Main and William streets is taking on a rather naked aspect as the old edifice rapidly disappears, and many citizens regret to see it go. The construction of a modern service station on the corner of William and Main streets on the site formerly occupied by the Imperial Hotel is going on apace. The work is being done by the local automobile firm of McRae and Embury in conjunction with the British American oil Company, and will be a valuable addition to the property already controlled by the aforementioned local firm. The concrete foundation for the structure is poured in position and within the next few weeks, Palmerston’s newest business enterprise will take form.